If you’re thinking about purchasing a new home or refinancing your existing mortgage, you should know that your credit score is hugely important. In fact, it can make or break your approval and carries the most weight when it comes to determining your mortgage rate. Why are credit scores so important, you ask? Well, banks and mortgage lenders use your credit score(s) to evaluate your creditworthiness, which is essentially the best measure of default risk, coupled with things like down payment, income, assets, and property type. 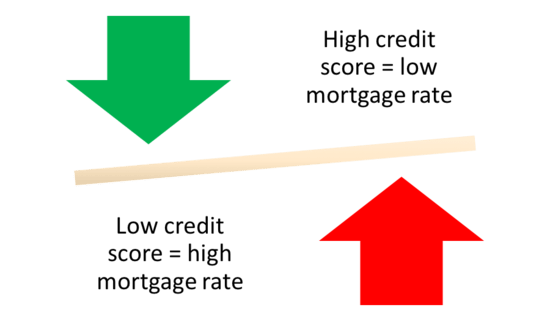 Are mortgage credit scores different? First and foremost, you might be wondering which credit score mortgage lenders use, seeing that there’s no sense focusing on something they won’t actually look at to determine your creditworthiness. I’ll save you the suspense. The short answer is FICO scores, which are the industry standard and relied upon by just about everyone. I think something like 9 out of 10 lenders use FICO, and it’s pretty much 100% in the mortgage world. As for the version of FICO, I don’t know if any mortgage lenders use the newer FICO 8 or FICO 9 scores, which are the latest iterations available, because they tend to upgrade slowly to avoid any unwelcome risk. This also explains why FICO is pretty much the only game in town – it’s hard to change the status quo because there are a lot of moving parts (and investors) in the mortgage space, so one seemingly small alteration could have major ramifications. What mortgage lenders use VantageScore? At the moment, none as far as I know. VantageScore is working very hard to change that, but we’ll see if it actually materializes. FHFA director Mel Watt, whose agency oversees Fannie Mae and Freddie Mac, recently noted that any credit score model change would not go into effect before 2019. And he didn’t sound optimistic that there would be a change, despite the introduction of a bill called “The Credit Score Competition Act of 2017” that wants other credit scoring models to be considered. VantageScore has argued that it scores millions more consumers than FICO, and some of these consumers could be potential mortgage applicants. But FICO argues that very few unscoreable borrowers would actually want/qualify for a home loan. Stay tuned on that one. While it might sound unfair to only allow one company to score mortgage applicants, it does mean that consumers should focus on their FICO scores since they seem to be the only ones used by lenders, at least for the moment. That being said, those other scores you receive for free often aren’t the same as the ones the lenders pull, though they’re typically not far off. So they can be beneficial to give you an estimate of where you stand. Just don’t be surprised if they’re different. And notice I wrote scores, not score. There are three FICO scores you need to be concerned with, including one from Equifax, one from Experian, and one from TransUnion, which are the three main credit bureaus, as seen in the table above. Don’t expect a mortgage lender to only use Experian, or only use TransUnion, like some credit card issuers might do. This is a big loan so they’ll want to assess risk across as many platforms as possible. The models in that table above tend to be the most commonly used, though there are mortgage industry-specific versions of FICO scores as well that may come into play. The credit scores range from a low of 300 to a high of 850. The higher you score the better, though you don’t need a perfect score to get approved for a mortgage, or to obtain an excellent rate. Before you actually head out to get a mortgage, it’s good practice to view your credit scores long before you apply. I’m talking several months in advance because any necessary credit score changes/improvements take time. Potentially a lot of time. For example, any mistakes (or legitimate issues) holding your credit score down may take months to get cleared up. And you won’t want to leave anything to chance. Yes, the credit bureaus are bureaucratic, so nothing happens all that quickly. Also, be sure to go with a service that allows you to see all 3 credit scores from Equifax, Experian, and TransUnion, as mortgage lenders typically pull a tri-merge credit report, which includes credit scores from all three of those bureaus. The bureaus each report information a little differently, so knowing just one score won’t do you (or your lender) much good. Aside from the scores, payment history and amounts may differ, so it’s important to see them all. As far as lenders are concerned, it basically allows them to triple-check your credit before making the decision to hand over a large sum of money. They use the mid-score for pricing/qualification, so it’s imperative that all 3 credit scores are in tip-top shape. For example, if your credit scores are 650, 680, and 720, a mortgage lender would use the 680 score, which is a decent but below-average credit score. You basically don’t get credit for the 720 score, though they throw out the 650 score as well. Alternatively, if you had scores of 710, 720, and 730, they’d use the 720 score and you’d be in much better shape. *If you only have two credit scores, lenders will use the lower of the two for qualifying purposes. If you only have one, they will use that one, though not all lenders approve borrowers with a single credit score, aka limited credit history. Tip: It might be possible to get approved for a mortgage without a credit score, though not all lenders are willing to extend such financing. Additionally, stricter requirements will accompany such approvals, including higher minimum down payments and lower maximum loan amounts. If there is a co-borrower involved, the lender will typically take the lowest mid-score of both borrowers. So using our example from above, if the co-borrower has credit scores of 610, 640, and 655, the 640 credit score would be used, seeing that it’s lower than the main borrower’s mid-score. Assuming a co-borrower has poor credit, and isn’t absolutely necessary for qualification purposes, it might be in your best interest (literally) to keep them off the loan (you can still add them to title). That way you’ll get better pricing. Put simply, a lower credit score will lead to a higher mortgage rate, and vice versa. That means you’ll pay more if your credit score is low. This all has to do with risk. The lower your credit score, the higher the chance you’ll default on your mortgage, at least that’s what the statistics say. So if your credit score is too low, you probably won’t even get approved for a mortgage (how to get a mortgage with a low credit score). Lenders simply won’t want your business. It’s just too risky. But assuming you are approved with sub-par credit, why accept an inflated interest rate and a much higher monthly mortgage payment? You’d be throwing money out the window. For example, if your mid-score is 650, as opposed to 660, you could wind up with a higher mortgage rate because lenders typically have a pricing threshold at 660. There’s another one at 720. In other words, you’ll want to be at 660+, or 720+, as opposed to 659 or 719, in order to receive the most favorable pricing. If you were able to increase your score just 10 points (or less), you could save yourself money each and every month you hold your mortgage. That could equate to a lot of cash over 360 months. If this happens to be the case, you might as well work on your credit beforehand to get your scores up that little bit to cross over into the higher threshold. It’s one of the few things you might be able to control that can make a big difference. Also note that banks and lenders have become even more stringent lately, requiring higher credit scores than they have in the past, meaning credit has just gotten that much more important and should not be taken for granted. For example, there is now a minimum credit score of 500 on FHA loans. In the past, there was no minimum whatsoever, which is hindsight sounds like a horrible mistake. Now, a 500 credit score is pretty dismal, but many individual banks require higher-than-minimum credit scores for FHA financing that better suit their own risk appetite, such as a 600 credit score. So the minimum score is a bit deceiving, and your odds of getting approved with a 500 credit score are pretty slim. However, Wells Fargo, now the nation’s top mortgage lender, recently lowered its credit score requirement on FHA loans after some public pressure. But keep in mind that if you want to qualify for the FHA’s flagship 3.5% down loan program, you need at least a 580 credit score, otherwise you’ll be stuck putting at least 10 percent down. As far as conventional mortgage loans go, a credit score below 620 is typically considered subprime, meaning you’ll have a difficult time qualifying for a mortgage, and if you do, you’ll receive a subprime mortgage rate. By subprime, I mean higher. For loans backed by Fannie Mae and Freddie Mac, a 620 FICO score is the minimum score allowed unless there is some kind of exception or nontraditional credit is used. So make sure you have at least a 620 score to keep your loan options open. 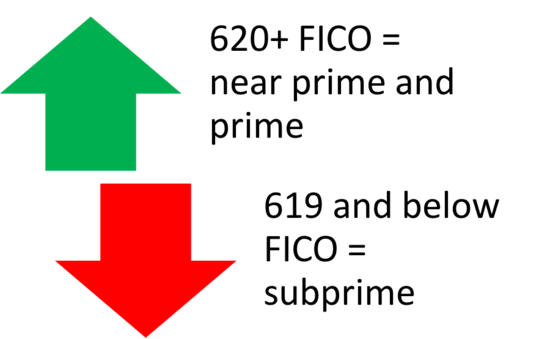 Credit scores between 620 and say 680 may be considered “near-prime,” that is, they aren’t bad but they aren’t necessarily that good either. In general, you want a credit score of 720 and above to avoid any negative pricing adjustments, but a 760 credit score might be the new rule if you want the best possible terms and lowest rates. If you’ve got excellent credit, you can even get a reduced mortgage rate, so it’s always recommended to aim for the sky. And though credit scoring is just one of the many criteria used to judge your borrowing capacity, it impacts how much you can borrow, your max loan-to-value ratio, and what you can do (cash-out refinance vs rate and term refinance). In summary, your credit score is probably the one thing you have complete control of, whereas things like occupation, income, and assets can be at the mercy of external forces. So do your best to strive for perfection in order to get the best deal on your mortgage. Credit scores aren’t everything, what’s on your credit report matters as well! Don’t mess with your credit before or during the loan application process! Any mistakes or missteps can be corrected, but take time, often several months! I was curious about the FICO scores used. I have a subscription to myFICO, but shows a FICO 8 score, which I guess is the current algorithm they are using. Do you know where these scores pull from as I’m assuming they don’t use myFICO.com. I would like to know which consumer service provides the best indicator of what a lender may pull as I know they can vary (ie. credit karma scores are quite different from myFICO…). Thank you! I don’t think any mortgage lenders actually use the FICO 8 score…instead they use older models of FICO. Experian uses FICO Score 2, Equifax uses FICO Score 5, and TransUnion uses FICO Score 4, which are industry-specific versions for mortgages. The score(s) you see on myFICO could be very close to the ones a lender pulls or quite different depending on what’s going on with your credit history. If you’ve got excellent credit and there’s nothing out of the ordinary in your history there’s a good likelihood you’ll score similarly when a mortgage lender pulls your credit. Ultimately the only thing you can control is your own credit, not the models they use, but fortunately good credit habits tend to equate to good scores on all models, even if they diverge by a few points here and there.